Carl Ling, M.D. FASMS was raised in the Maryland suburbs of Washington DC. He completed his undergraduate studies at the University of Chicago, where he graduated with honors, majoring in Biology. He then earned his M.D. degree from Univ. of Illinois Medical School in Chicago, where he also performed his medical internship. Dr. Ling then received 3 years formal ACGME (Accreditation Council on Graduate Medical Education) accredited training in Dermatology & Mohs Skin Cancer Surgery from Texas Tech University School of Medicine under the direct supervision of the author of one of the leading textbook on MOHS Surgery. Dr. Ling consistently scored in the top 20 percentile among all Dermatology residents in the annual national dermatology training exams. He also completed a formal Ophthalmic MidFacial Plastic Surgery fellowship training at the McGill University School of Medicine, and a Cosmetic Surgery Fellowship at the Graduate Hospital associated with the Univ. of Pennsylvania School of Medicine in Philadelphia. Dr. Ling is Board-Certified by the American Board of Dermatology. He is the Lab Director of Verghese & Ling MD PA’s Maryland state approved MOHS Surgical Histology Lab, which is also CLIA-certified and Medicare approved. 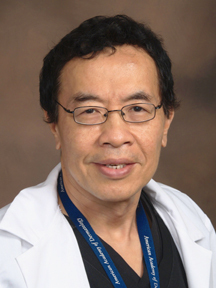 Dr. Ling is the author of several medical journal research papers and publications. In addition to his private practice in Dermatology, Laser, and Mohs Skin Cancer Surgery, Dr. Ling is a part-time faculty member of the Univ. of Maryland School of Medicine’s Dept. of Dermatology. He resides in St. Mary’s County (for more than 14 years). His hobbies are swimming and books. All our professionals at Verghese and Ling, MD PA maintain the highest levels of accreditation and pursue ongoing education to stay abreast of the latest trends in dermatology. Verghese & Ling, M.D. PA have Certified Medical Assistants, RN, LPN, skilled receptionists, certified medical billing personnel, and trained administrative assistants to help you with your medical and office needs. Charlene is our office administrator. Here are Biographies & backgrounds of OUR TWO DOCTORS: ANNIE VERGHESE MD & CARL LING MD. CARL LING, M.D. FASMS was raised in the Maryland suburbs of Washington DC. He completed his undergraduate studies at the University of Chicago, where he graduated with honors, majoring in Biology. He then earned his M.D. degree from Univ. of Illinois Medical School in Chicago, where he also performed his medical internship. Dr. Ling then received 3 years formal ACGME (Accreditation Council on Graduate Medical Education) accredited training in Dermatology & Mohs Skin Cancer Surgery from Texas Tech University School of Medicine under the direct supervision of the author of one of the leading textbook on MOHS Surgery. Dr. Ling consistently scored in the top 20 percentile among all Dermatology residents in the annual national dermatology training exams. He also completed a formal Ophthalmic MidFacial Plastic Surgery fellowship training at the McGill University School of Medicine, and a Cosmetic Surgery Fellowship at the Graduate Hospital associated with the Univ. of Pennsylvania School of Medicine in Philadelphia. Dr. Ling is Board-Certified by the American Board of Dermatology.